Are you looking for a company that produces reliable steel carports? That gives you the flexibility of allowing you to easily design and customise your own products? Then MF Steel is your answer. MF Steel's range of carports and shelters are the perfect way to protect your valuable vehicles from the infamous Gauteng hail storms. We manufacture and install all styles of iron carports, including dome carports, peak carports and flat carports. 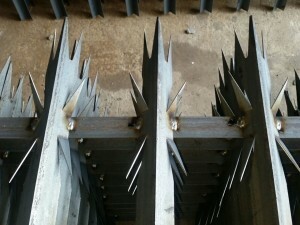 Our carports are manufactured from the highest quality materials. We use IBR sheeting and 0.5 full hard Lip Channels 150 x 50 x 20. Carport posts 76 X 76 square tubing for standard carports. When we build a carport we build it to last! All our carports come with a 1 year warranty on our workmanship. At MF Steel, we apply a primer, undercoat and top coat in a variety of colours. 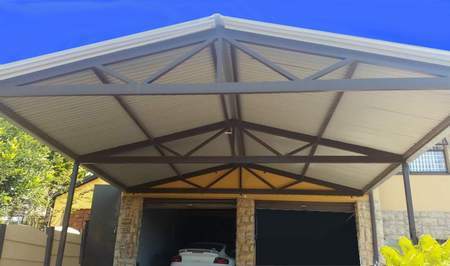 This gives a very long lasting and robust finish, coated in a vast range of colours to blend your carport into its environment and prevents rust and degradation. We will provide you with a choice of colours to suit your environment or your company’s brand image. We deliver most of our products within two weeks, but this can be longer or shorter depending on workload. We will not make a time commitment that we cannot keep.